The Neuroimaging Center (NIC) is a core research platform of Focus Program Translational Neuroscience Mainz (FTN) and of Johannes Gutenberg University Medical Center Mainz. We are member of the Rhine-Main Neuroscience Network (rmn²), a strategic research alliance formed by neuroscientists in Frankfurt and Mainz. We provide support in key methods of human systems and cognitive neuroscience, incl. neuroimaging, to all interested parties within the regional neuroscience community. 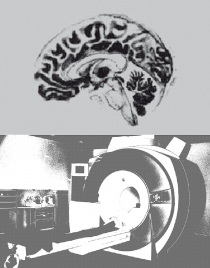 The NIC has at its disposal research-only scanning time on a 3 Tesla Siemens TIM TRIO MR scanner (one 12-channel and two 32-channel head coils); equipment for peripheral stimulation, psychophysiological recordings and eye-tracking; MR-compatible 64- and 256-channel EEG, MR-compatible tDCS, and TMS; two fully equipped psychophysiological laboratories for behavioral studies; dedicated Linux and Windows servers, access the University’s high-performance computing facility (Mogon), analysis software; and an office suite with terminals for data analysis. Services include regular methods teaching activities (NIC courses), advice with study design, ethics applications, stimulus presentation, sequence selection, and data analysis; and bi-weekly discussion and project presentation meetings (NIC meetings, see “Aktuelles” for upcoming meetings). From beginning of 2019, the NIC will be housed in a new dedicated neuroimaging building that will harbor two research-only 3 Tesla MR scanners, an EEG suite, 3 TMS and other laboratories and office space for research groups.